How is a leader of a 18th century religious revival like a defensive lineman? 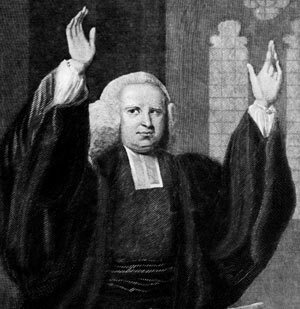 In the 1730s and 1740s, a religious revival known as The Great Awakening swept through the American colonies. This first mass cultural experience in the American colonies left an enduring impact on American religion and culture. Rev. Rachel Lonberg will explore the Great Awakening and Unitarians’ role in it —and what that mass cultural experience has to teach us about the Super Bowl. Baby/toddler care is available beginning at 10:00 a.m.
Hospitality in the Foyer with coffee, tea and snacks starts at 10:15 a.m.
Sunday Services begin at 10:45 a.m. Visitors – please see our Welcome page to get more information before attending your first service at People’s Church. Want to see past or future Sunday Service topics? Visit the Sunday Service page. Use the Kalamazoo River Valley Trail to get here! Subscribe to our newsletter and join our 468 subscribers. People's Church of Kalamazoo • Designed & Developed by 2 Acre Studios.